NutriFEEDO Lite® is a food intervention for children afflicted with Moderate Acute Malnutrition. It helps children in exiting acute malnutrition and preventing their re-lapse into Severe Acute Malnutrition. The product is easy for children to eat because it dispenses readily from a tear-open package. As per WHO Guidelines, Moderate Acute Malnutrition is defined as a weight-for-height score between −2 and −3 or a weight-for-height percentile (WFH) between 70% and 79%, compared with a reference population. Although characterised by moderate wasting and stunting, children may progress to Severe Acute Malnutrition if left untreated. NutriFEEDO Lite® is a Ready-to-Use Supplementary Food geared towards meeting the nutritional requirement of the moderately malnourished children within the age group of 6 months to 59 months. 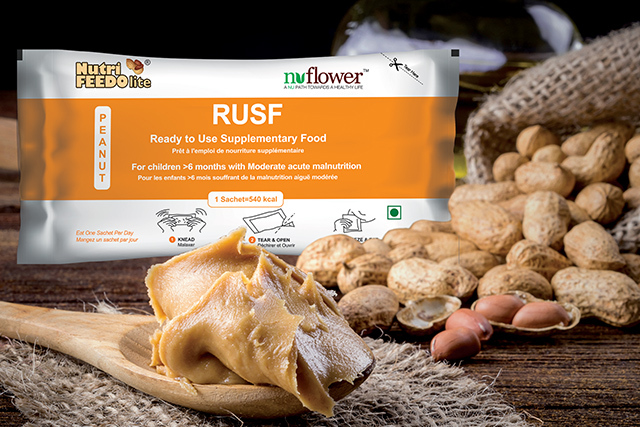 This peanut-based paste is similar to NutriFEEDO® in that its essential ingredient composition contains peanuts, sugar, milk powder and vegetable oil, enriched with a vitamin-mineral premix. However given the vicissitudes of its intended user base, which are moderately malnourished as opposed to severely malnourished, it has limited vitamin-mineral fortification.